Soldiers and security staff who have to be able to react flexibly and quickly to changing situations require a suitable communications infrastructure to ensure their coordination and to carry out their missions. Reliable voice and data links are crucial on such missions both for the user’s safety and for surveillance and management tasks characterised by a very high volume of information. Not all connections can be realised using radio sets: it must be possible to quickly, simply and safely establish wired connections with the aid of field cables. There are frequently no telephone networks near remote areas or in regions outside of Europe. This means that small, handy telecommunications systems need to be used which can cope with as many relevant connection standards as possible (analogue, ISDN, EUROCOM, data and radio). Moreover, it must be possible to operate these systems outside without the need for special protection means – whatever the weather. The Island Labs group, a provider of professional solutions for civil and military communications, has been very successfully developing and marketing mobile switchboard systems suitable for use in the field for years, with the primary emphasis on authorities and organisations with security functions (BOS). Several thousand systems are in use globally. All connection standards including radio links: the SB-230 can cope with all common connection standards (analogue, ISDN, EUROCOM, data and radio links): all over long ranges of up to 30km. Suitable for use in the field in all weathers in agreement with MIL standard: all of the system’s components right through to the terminal connecting field (which is extremely sensitive in common telecommunications systems) comply with the MIL standard for harsh environmental conditions. The SB-230 can be used in ice and snow, in the rainforest and even in the desert – all without the need for any special protection and tent superstructures. Light and handy/easy to use: in comparison to other telecommunications systems suitable for use in the field, the system is extremely light and handy: moreover, it is very easy to use. extensive range of accessories: field telephones, headsets, etc. External posts connected via field cables can be positioned up to 30 km away so that, in addition to maximum mobility, a large range can be achieved with the SB-230. To this end, telephones are used which have their supply voltage (LB). However, even remote-fed telephones can be located at a distance of up to 10 km away, which is more than adequate for mobile use. The advantages of digital ISDN terminals can also be used with the SB-230. With the aid of ISDN connection boxes (2 jacks each), ISDN telephones, fax machines and other ISDN systems can be connected to the 4-wired S0 bus at close range, which can amount to several hundred meters. 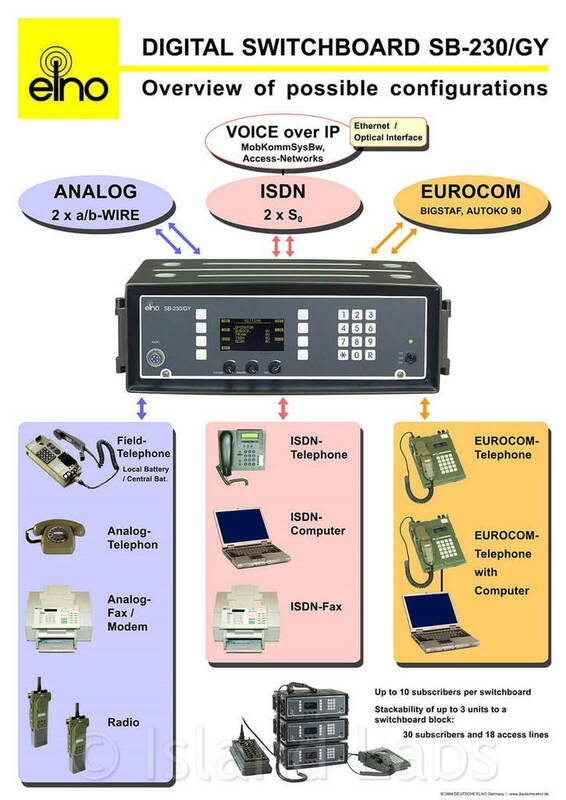 The close range for the operation of the digital EUROCOM field telephone (ET10) used by the German Armed Forces even extends up to 2.5 km. Naturally, modems, PCs and other digital signal sources can be connected for data transmission purposes. A particularly advantageous characteristic is the connect-ability of radio sets, particularly since as this interface is insufficient in many large switching nodes. It is for this reason that the SB-230 is used not only as a mobile switchboard but also as a front-end system for the radio expansion of switching nodes. In this way, for example, a remote radio set with connected dialling handset enables a subscriber to dial within a public telephone network. Furthermore, the switching capacity of the local exchange is correspondingly relieved in such a configuration. 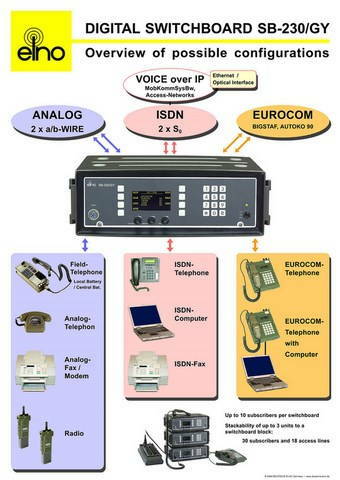 In the form of the SB-230, there is now available for the very first time a very robust and ultra-mobile switchboard system in agreement with the MIL standard which combines within it all the relevant connection standards (analogue, ISDN, EUROCOM, data and radio), each with a large range and easy operation. It can also be used for radio expansion and relieving switching nodes. View our trade fair poster on the Internet: the following block graphic explains the network and subscriber communications offered by the SB-230 field switchboard.